I am pleased to join you today for this special forum, which celebrates the 20th anniversary of the Hong Kong Special Administrative Region and takes the measure of Hong Kong as a potential engine for global growth. A welcome opportunity, in short, to look back over these past 20 years. To see how we got here, what has worked for us. And what we need to do over the next 20 years to replicate and, indeed, to scale new heights as a Special Administrative Region (SAR) of China. First of all, let's recognise that our success as an SAR wasn't ordained. That the road we've followed these last 20 years has been anything but smooth. The Asian financial crisis of 1997, the burst of the global IT bubble in 2001, the pall of SARS in 2003 and the global financial crisis of 2008 - the shock waves of which reverberate still: these and more have slowed us, to be sure. But only long enough for us to find our way again, and yet again, into the global fast lane. The numbers surely bear that out. Consider, for example, our per capita GDP last year. It came in at US$43,700, a cumulative real increase of some 60 per cent over 1997. At that level, we've already surpassed many advanced economies, including Germany, the United Kingdom and Japan. Consider, too, Hong Kong's economy. Over the past 10 years, it has grown 2.9 per cent a year, on average. That is notably higher than the corresponding 1.2 per cent average annual growth rate for advanced economies. These achievements have not gone unnoticed by the international community. Just two weeks ago, the International Institute for Management Development ranked Hong Kong the world's most competitive economy - for the second year in a row. We have also been ranked the world's freest economy by the Washington-based Heritage Foundation, for 22 years running. And we are certainly off to a good start this year. First-quarter results show economic growth up 4.3 per cent, year-on-year, the fastest since the second quarter of 2011. If the external risks continue to subside, our economy this year will probably perform better than our prevailing forecast of 2 to 3 per cent. Looking beyond the short term, we need to understand the underlying trends and dynamics in the global economy, if we are to rise up to the challenges and grasp the opportunities. The good news is that the global economy's eastward shift continues, led by the sustained growth of the Mainland of China. As the world's second-largest economy, the Mainland has contributed more than 30 per cent of global economic growth in the past few years. Given our deepening economic integration with the Mainland, Hong Kong is well positioned to cash in on the nation's rapid economic rise. Indeed, the Mainland's sustained development remains the pivotal anchor of Hong Kong's own economic development. And I would say the prospects for Hong Kong look very good, indeed, given the Mainland's continuing shift towards a service-led, consumption-based, innovation-driven economy. Regional co-operation is another variable critical to Hong Kong's future. The Guangdong-Hong Kong-Macao Bay Area, in particular, will appreciably enhance Hong Kong’s strategic role in the Mainland economy. The good news is that the Bay Area has become a key element of the national development strategy. As the Bay Area's leading international financial centre, Hong Kong has the expertise and experience - in financial, professional and business services - to help Bay Area companies "go global". Hong Kong companies are well positioned to join up with Mainland companies in their pursuit of international expansion. Excellent research has been coming out of our universities. Our information technology and other software infrastructure are well established. No less important, this Government has put a high priority on developing our innovation and technology (I&T) sector. On creating, here in Hong Kong, a regional I&T hub. For example, earlier this year, we signed an agreement with the Shenzhen Government to jointly develop an 87-hectare area, close to our boundary with the Mainland, into a world-class innovation and technology hub. In this year's Budget, I announced the establishment of a tax policy unit and a high-level Innovation, Technology and Re-industrialisation Committee to drive our effort in this respect. In this increasingly connected world, Hong Kong has extraordinary potential to reap the benefits in strengthening our role as a "super-connector". This is particularly true with the Mainland's far-reaching Belt and Road Initiative, which is now gathering momentum among more than 60 jurisdictions across three continents. All are keen to develop and deepen their connectivity - in infrastructure, trade, commerce, capital, culture and more. Hong Kong, long a global model of free trade and free enterprise, has what it takes - what the Belt and Road needs - to play a critical role in its progress, deep into the 21st century. As China's international financial capital, as well as the world's China financial capital, Hong Kong is the natural connector for the Belt and Road. Alongside our financial services prowess, we have a deep pool of world-class professional and commercial services - in engineering, architecture, law, accounting, management and consulting, communications and logistics, and so much more - to serve as the Belt and Road's hub for fund-raising, for high-end professional and commercial services and infrastructure development, operation and management. The Initiative will surely promote the use of the Renminbi in cross-border transactions, trade, investment and financing across the vast Belt-Road region. The Chinese currency's expansion can only boost our role as the world's offshore Renminbi hub and the region's leading financial centre. Our financial links with the Mainland go well beyond the Renminbi. Shenzhen-Hong Kong Stock Connect, launched some six months ago, followed the opening, in 2014, of Shanghai-Hong Kong Stock Connect. Together, they play a key role in opening up capital markets between Hong Kong and the Mainland. And there is more of that on the way. The People's Bank of China and the Hong Kong Monetary Authority announced, last month, their plan to establish Bond Connect. Through Bond Connect, Hong Kong will serve as a gateway for overseas investors looking to enter the Mainland's bond market, highlighting Hong Kong's unrivalled role as the intermediary for capital flow between the Mainland and international markets. This can only generate greater demand for Hong Kong's related financial services. Technical preparations are in place, with a view to rolling out Bond Connect as soon as possible. Hong Kong's future will be built on such connections, in finance and trade, in the embrace of the Bay Area and the Belt and Road, and much more. 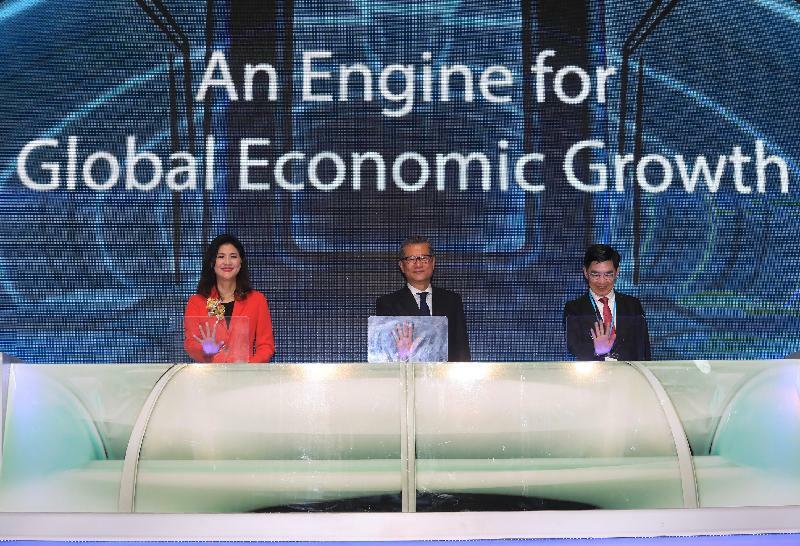 Cumulatively, they give Hong Kong a central stake in the Mainland engine - the Asian engine - for global growth. 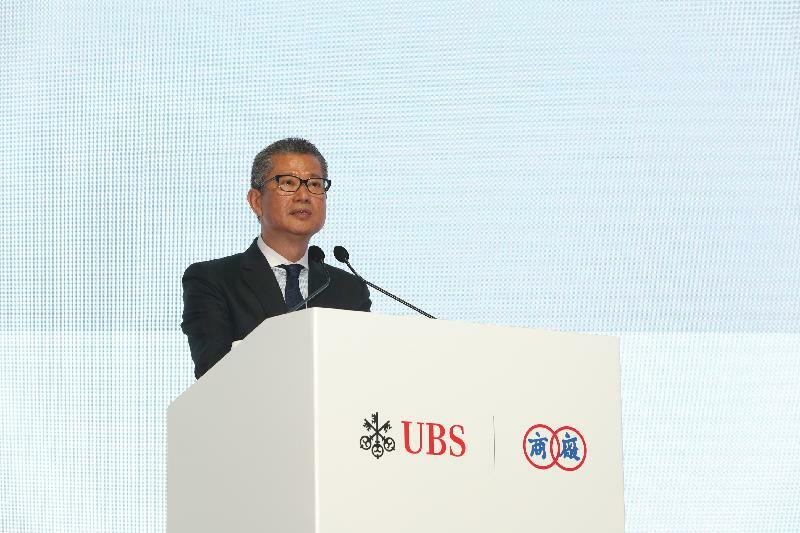 My thanks to our organisers, the Chinese Manufacturers' Association of Hong Kong and UBS Wealth Management. Ladies and gentlemen, I know you will enjoy today's forum. And I wish you all the best of business in the coming year. And the decades of promise to follow. FS attends forum on "Celebrating the 20th Anniversary of the HKSAR: An Engine for Global Economic Growth"